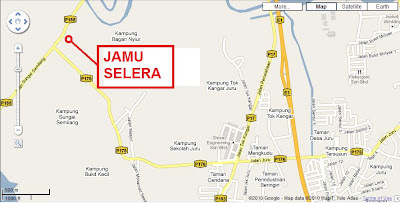 Jamu Selera is located at No. 503, Jalan Kuala Juru, Bagan Nyiur, Juru, Bukit Mertajam, Penang on the mainland of Penang where you have pass by Juru Autocity or Juru Heights. If you are using the North-South Expressway, you have to exit at the Juru Interchange (Exit 160). From the Juru Heights you have to drive in straight without turning left or right until you reach a T Junction and turn on your right hand side. About 100 meters, you will notice Jamu Selera with a banner on your right hand side. Jamu Selera is nearby to fishing village if you travell down Jalan Kuala Juru. 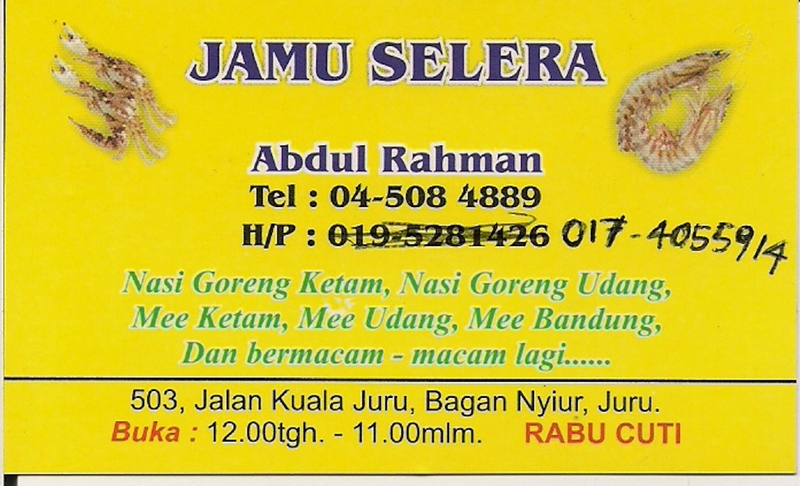 Jamu Selera is famous for its Mee Udang & Ketam. Besides Mee Udang & Ketam, they also serve Nasi Goreng Ketam, Nasi Goreng Udang and Nasi Putih Ikan Bawal. No. 01 : View of the Restaurant from Jalan Kuala Juru. The taste is almost similar to the chinese prawn mee (Hokkien Mee). The taste of the soup is much sweeter because of the crabs. Fried Rice is served with a bowl of Soup Udang. The taste of the soup is the same like the mee udang. 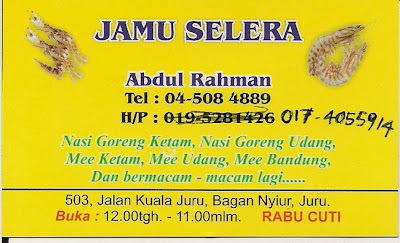 On the 24th July 2010, I was around the Juru Autocity and decided to patronize Jamu Selera for my lunch. No. 08 : Mee Ketam. The taste was still remain unchanged.... still tasty. No. 09 : Mee Udang. The Taste was still as good as before. No increase in Price .... still remain the same RM5.00 per bowl with 5 Shrimps. Wow..look really yummy, Sam! I must try this the next time i am up north! Kurt... let me know when u are up in the north and allow me to take u there.